On the 7th of February, 1856, the New Mexico Territorial Legislature took a stand. No more living in sin. That sort of depraved conduct just wouldn’t be tolerated. 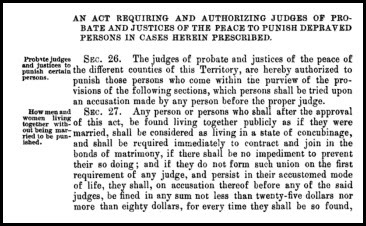 But for a genealogist, this sort of law is just wonderful, because it helps on occasion to explain not just what our ancestors did — but why. And why a particular action was taken at a particular time. That quickie marriage we find in the records may not have been the shotgun marriage we thought it was. Oh, there might have been some coercion involved in tying the knot, but in New Mexico at least it might have been from being caught in the sack by the law. The way I read it, it was aimed at gossips and tale-tellers — meddling busybodies. I wonder if that law was the reason New Mexico had no waiting period between obtaining a marriage license and getting married. At least, that’s the way it was in the 1950’s when my parents got married in Raton just hours after obtaining the license. It sure could have contributed to that, Jackie! Stopping nosey people is nice but who is discovering all the cohabitating people? A different group of busy bodies, of course! The troublemakers were frequently ex-husbands/wives/lovers seeking vengeance on one or the other of the cohabiting parties. I’m sure those were among the busybodies, yes. But it was also directed at Native Americans and non-Catholics. The law appears to exempt couples for whom there was an impediment to marriage. It is not clear from the quoted language whether this was an enduring exemption. I have the right to remain silent and — especially with you! — anything I say might be used against me!